PRINCE2 Agile Foundation & Practitioner teaches anyone how to combine agile methods with the framework of PRINCE2® in their projects. As an Accredited Training Organisation we like to ensure that our clients, affiliates and the general public are informed and up-to-date on the latest with regard to best practice in project management industry. Here you will find the latest information resources including case studies, whitepapers and other downloads. PRINCE2 (PRojects IN Controlled Environments) is a project-based method for effective project management. PRINCE2 is a de facto standard used by the UK government, which is widely used in the UK and internationally, including in the private sector. Improve your project management skills and career prospects by obtaining a PRINCE2 certification - register now! We have more than 30 years of knowledge, lots of expertise and innovative multi-media courses. Gain first-class project management skills! 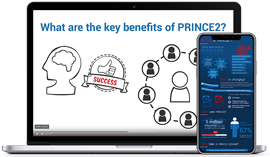 Adding a PRINCE2 certification to your CV gives you the skills and confidence you need to successfully manage projects, and will improve your chances in the job market. Get free downloads, webinars, case studies, answers to frequently asked questions and more. Our extensive PRINCE2 resources can help you all the way through your journey to qualification. Start your training and take your exam online, from any country, right now!